KARACHI: After making a partial recovery a day ago, the stock market on Wednesday faltered again with the benchmark KSE 100-index losing 133 points to close at 41,621. The market started trading on negative zone mainly due to the prime minister’s approval of massive increase in gas tariff. The stock investors were also closely observing US Secretary Michael Pompeo’s visit to Islamabad who suggested resetting the relationship between two countries and start afresh. The volume was relatively unchanged from yesterday, clocking in at 126 million shares with total value traded at Rs5.48 billion. 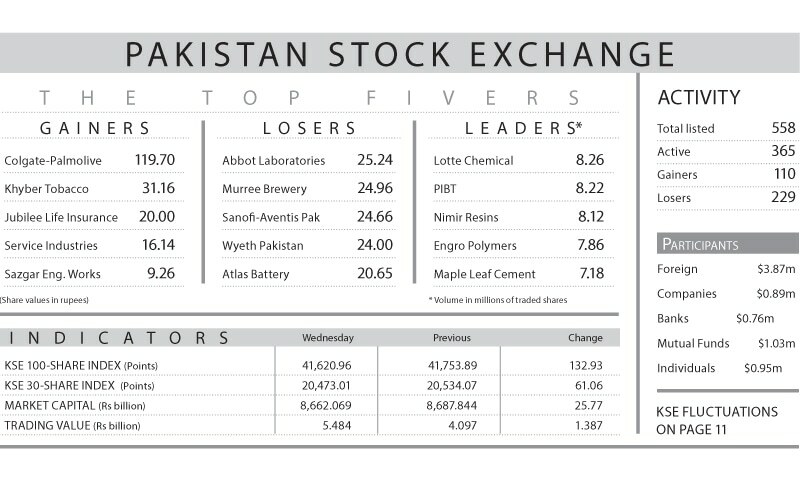 Lotte Chemical at 8.26m shares, followed by Pakistan International Bulk Terminal 8.22m, Nimir Resins 8.12m, Engro Polymer and Chemical 7.86m and Maple Leaf Cement at 7.18m came out as the volume leaders. Kot Addu Power Company closed the session up 3.95 per cent, after announcing financial results above market expectations primarily led by the higher than expected other income during the last quarter. Contribution to the index slide was led by fertiliser, losing 42.74 points, followed by cement 32.91 points, oil and gas exploration 26.46 points and auto assemblers 10.79 points, cumulatively scrapping 112 points. Amongst fertiliser, Dawood Hercules declined 1.98pc and Engro Corp 0.51pc whereas Pioneer Cement 3.51pc, Lucky Cement 0.79pc and DG Khan Cement 1.25pc led the losses in cement sector. Furthermore, Honda Atlas Cars posted a 2.49pc decline amongst the auto assemblers. On the flip side, Kot Addu Power closed the session higher by 3.95pc, Searle Company 2.42pc and Allied Bank 2.82pc added 44 points. Foreign investors turned out to be net sellers, offloading $3.87m from the market whereas local buyers raked up $3.86m with leading contribution from mutual funds.